They couldn't have given us a much tougher game to start with. Bolton had just missed out on the play-offs in the previous season, losing sixth place on the last day to their manager Dougie Freedman's former club Crystal Palace. Palace had gone up. That, for those of us who like to travel to away games, was a bonus. Shall we say it is not the easiest of places to get to and I've been stuck in traffic in the Croydon area far too many times to mention over the years. They'd gone up with champions Cardiff and runners-up Hull. The three of them had been replaced by QPR, Reading and Wigan who had just handed our former manager Owen Coyle a lifeline by giving him the manager's job previously held by Roberto Martinez who had gone to Everton. I knew I was going to miss Martinez at Wigan, if only for the number of times Dave Whelan could get the name 'Roberto' into interviews. He tried it with 'Owen' but it didn't have the same ring to it and, in any case, why bother with anything that's nothing other than temporary? Setting the scene we also had the three changes at the other end of the table. Peterborough, Bristol City and Wolves had gone down. Doncaster and Bournemouth had taken the top two League One places with Yeovil coming up as play-off winners. Brian Flynn, still a familiar figure in the Burnley area, had managed Doncaster to the title with a dramatic last minute at Brentford on the last day after the home side won a late, late penalty. They failed to score from it and Doncaster stormed down to the other end to score. Flynn was jumping up and down on the touchline reaching great heights, well maybe just heights, and his team had pipped Eddie Howe's Bournemouth for the title. You have to hand it to Howe. He might not have shown any signs of being successful at Burnley but he sure knows how to manage Bournemouth. His return had signalled a major turnaround in form and in doing so he'd become the first manager there since Harry Redknapp to lift them into the second tier of English football. Without doubt Yeovil were going to be the smallest club in the division but would probably become the biggest cider drinkers of the 24 clubs with Brizzle having been relegated. Peterborough going down, coupled with a retirement elsewhere, meant no manager in the top two leagues with the name Ferguson. Dad had been a great success, Darren is so in his own mind only. And what about Wolves? Back in the 1980s they suffered three successive relegations. Surely this wasn't going to happen again. They went down after inspirational appointments such as Stale Solbakken and Dean Saunders. By now they were surely regretting the decision to sack Mick McCarthy. Perhaps not. The next man was going to be the fourth since McCarthy went. They considered the man who went to Wigan but instead opted not to take him. Phil Collins might not have needed a jacket but Wolves decided they did and appointed former Millwall manager and former Watford player Kenny Jackett as their new manager. It's nice to see some of the 'so called' bigger clubs a division below us. It shows just how well we've done over the last decade or more since Stan brought us up. What a pity it wasn't League One Leeds (LOL) again. Back to us. The sale of Austin to QPR less than 24 hours before our lunchtime kick off was a massive blow. Sean Dyche admitted we'd have to go with what we had for the opener but was obviously ready to fill this latest gap as soon as possible. The always positive manager said it was an opportunity for someone else and that someone else was, as expected, Sam Vokes. He'd played in all 46 league games in 2012/13 season but, of those, 33 of them were as a substitute. He'd scored four goals and now we were asking him to step into Charlie's boots and become a regular goalscorer. The one plus was the fact that we did always seem to get good results when Charlie was out of the side. There was never any real logic to it but facts are facts. Despite those stats I still didn't like the idea of us losing our potent goal threat. Having opted for Vokes to replace Austin, Dyche went with the eleven everyone expected, and ahead of the game he said: "In pre-season we've had some good performances with a nice energy to the team, and we want to take that into the season. It's important we do that with a tough first fixture against Bolton. "We want to build on last year, make no mistake. We haven't been able to do that financially but we think we have got some good players with a good squad mentality and a good group mentality, and that can be a real weapon so we want to build on last year. "We want to deliver performances and really fine tune what we were getting to last year. I made it clear there has to be a framework to keep the team solid but we want that freedom to go and play and to explore the finer arts, if you like, of football and score goals." He also had a message for the fans on the eve of the season. "The biggest thing is to get behind us," he said. "The biggest thing, as ever, is to support, that's the nature of it. "We know we are a town that is dominated by the football club, and rightly so, and there is that link between the community and the football club and it works both ways, but every Saturday and every Tuesday or whenever that game's played we want to make sure we give that nice good feel, that one club mentality that I mentioned as soon as I got here because there is no two ways about it that when you get everyone's noses pointing in the right direction it's helpful to all." The big kick off arrived and it started with a draw. Danny Ings gave us the lead midway through the first half but Darren Pratley equalised for Bolton eleven minutes later. The goal was originally credited as a David Wheater own goal but the club took it upon themselves to get it changed and so Ings it was who got our first goal of the season. I wrote after the game that both sides would probably be happy with the point, but having watched the game again I really did think we were the better side and might probably have gone on to win it. Still, a point, we were off the mark and ready for two trips into Yorkshire, to York for the cup and then the league game at Sheffield Wednesday. It turned into a week of traffic james, Yorkshire fish and chip shops, and a couple of good results. Our meticulous plans for the York game, taking in a Blubberhouses pick up for Yorkshire's Ant & Dec, all went smoothly until we were around an hour from the ground where we once went in our thousands and came home as champions. The plan was to park up, walk into the city and enjoy some of the hospitality provided in terms of food and drink. Due to some horrendous traffic problems that last mile took us over an hour. The city centre was out, the chippy round the corner from the ground was in and then it was time to take our place on the open terrace which one member of the local constabulary once thought housed Roy Wegerle. There was a decent following of Burnley fans and an equally decent turn out of dolphins. Why on earth some of the York stewards took a dislike to them but their actions were unnecessary, particularly those of one who was being told couldn't see a significant part of his anatomy. I think it was due to him having a veranda over the toy shop. I saw two things from the team that night that left me feeling positive. The first was the way we started the game. David Jones scored the opener from a corner in an opening spell where we simply ripped York apart. That was after Vokes had already hit the bar, Ings had fired just wide and Vokes had seen another effort well saved. If that was good then, when York came into the game, some our defending was exceptional. We had to battle for a while to hold onto the lead and our defenders got bodies in the way when needed and we really did look a side that were ready to fight for each other. In the end class told. Once Junior Stanislas had added the second on the hour it was all over and Ings got his second of the season before Scott Arfield joined Jones in getting his first Burnley goal to give us a 4-0 win and a home tie against Preston. The journey home might have been trouble free but for one of our passengers having us chase round petrol stations to try and buy a can and then some petrol to put in it, but we eventually got him and prepared for Hillsborough. I don't know who owned the caravan that decide to tip on its side on the M62 east bound but this was another ridiculous hold up to rival that at York. I was on the supporters' club coach for this one and there was widespread panic that we might not make kick off. Not only did we get there in very good time but there was ample opportunity to visit the Leppins Lane chippy. This time it was necessary. It was my third visit to this particular establishment and we'd won on the previous two occasions. I didn't really want them but sometimes you have to make sacrifices for your team. Having said that they were good, although probably not quite as good as those enjoyed at York. 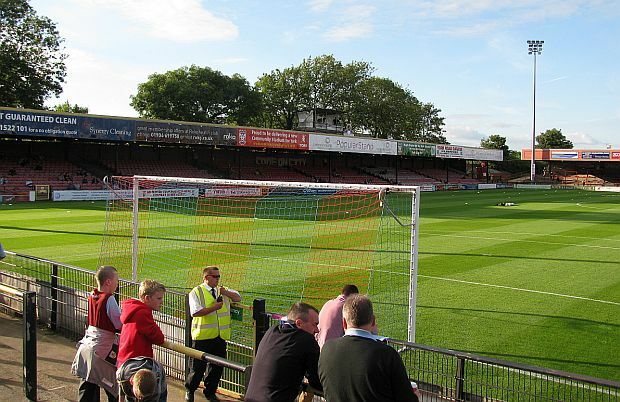 Inside the Leppins Lane stand, one that always poignantly leaves me with thoughts of that awful day in 1989, we were met with considerably more helpful stewards than had been on duty at York and considerably more dolphins that had got themselves anywhere near Bootham Crescent. 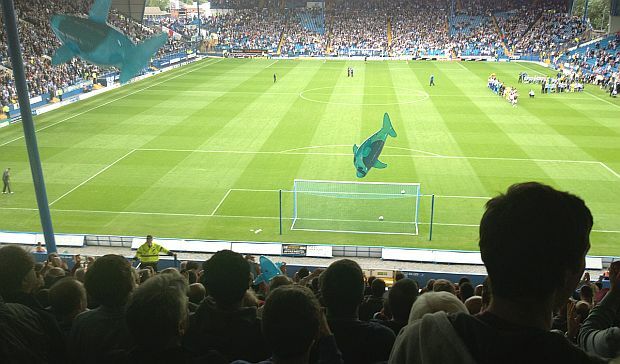 I might never have gone swimming with dolphins but I'm sure this experience more than matched it as they flew around the away end throughout the pre-match build up. The game provided us with our first league win of the season. Ings and Vokes both scored headers within five minutes of each other in the last 12 minutes of the first half and that was always going to be enough. Wednesday did put us under a bit of pressure in the second half and pulled one back through David Prutton, but the points were deservedly ours. It's hardly worthwhile looking at league tables so soon in the season but if you had done you would have seen us in fourth place with our four points whilst Watford, Blackpool and Nottingham Forest sat above us with a maximum six points. We were still fourth a week later after beating Yeovil 2-0 at home in what was our first ever game against them, but Watford and Blackpool drew so only Forest, on nine, now had more points than us. This wasn't a performance to get too excited about; indeed with quarter of an hour to go it was still 0-0 and a goal didn't look too likely on a day when those of us in the seventh row of the Longside Upper took something of a drenching as the August weather turned a bit nasty on us. Sometimes it takes a moment of inspiration to turn a game your way and sometimes it takes a change. Dyche made a double change. off came Ross Wallace and Stanislas and on came Keith Treacy and Arfield. The pair of them immediately started to put Yeovil under some pressure as they took on defenders but there was, perhaps, some good fortune when Treacy, who spoke passionately about the influence of Dyche after the game, scored the first. With the ball by the left wing corner flag he moved inside a defender and then curled the ball home off the underside of the bar. Goalkeeper Sam Johnstone might have been at fault but did Treacy mean it? He smiled when asked. Arfield wasn't going to be outdone. He fired in a shot of his own. In truth it was going well wide but it cannoned off Vokes and into the net. This was proving to be a decent start but things went wrong a week later in bizarre fashion when we went down to a 2-0 defeat at Brighton. We'd received a blow in the week leading up to the game with the news that Ross Wallace needed knee surgery and wouldn't play again until after Christmas. Dyche opted to start with both Treacy and Arfield but probably the only positives I can recall from this particular day was the fact that we got there and back, again by coach, with no hold ups. The first half an hour was fairly even with neither side offering too much to be fair, but it changed as Brighton got a grip. They scored one goal through Andrew Crofts and might have had a second but for the intervention of Tom Heaton. Both incidents followed poor errors by Kevin Long who, prior to this game, had made a decent start to the season. One cost us a goal and one cost the goalkeeper a yellow card. Some might say it should have been red but pictures showed afterwards that perhaps referee Darren Sheldrake might have got it right. Whether he did or he didn't, he certainly got it ridiculously wrong in the second half when he made up a rule of his own and sent off Heaton for apparently throwing the ball in the air, at a time when he was actually being fouled. We were the better side at the time but Brighton knew exactly how to play against ten men and did so with some ease, adding a second goal through Leo Ulloa and deservedly, in the end, taking the points. We had a week leading into the international break and it proved to be a good one. We beat Preston 2-0 at home in the cup with Ings getting both and then went to Derby on the last day of August for our fifth league game. This was not just our third win in five league outings, it was also our first really outstanding performance of the season. Just as in the previous away win in Sheffield, both Ings and Vokes scored with former Ram Jason Shackell getting the last one in a 3-0 win. The Ings goal was superb. He was in his own half when he received the ball via a superb flick from Treacy, and then went on a brilliant solo run before sliding the ball past former Claret Grant. Grant was at fault for the second but Vokes added to his collection of involuntary goals. Remember the one off his fat arse at Cork? This time the ball was smashed into his face by Derby's Will Hughes and straight in. Andy Madley provided us with more ridiculous refereeing. He was awful all afternoon but the penalty he awarded against Shackell with the score at 2-0 was outrageous as the Burnley captain won the ball cleanly right in front of him. I was 150 yards away and could see there was no contact with any Derby player. And the third came when Shackell delighted at volleying home a corner and it took us into the first international break in third place in the table. Vokes had been sensational in this game. He was certainly making me eat my pre-season words and it had almost been forgotten that we still hadn't signed Austin's replacement. The window was closing late. We had until Monday to bring in a striker and after the break we had a visit from our old friends from Ewood Park to look forward to. They were 11th in the table although only three points behind us. Should they come and beat us they would go above us. We weren't going to let that happen this time. 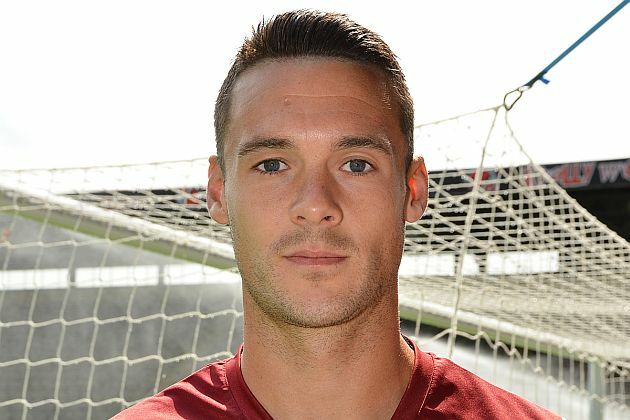 It had been a decent start, better than many of us envisaged and Jason Shackell was voted as the Clarets Mad Player of the Month for August.